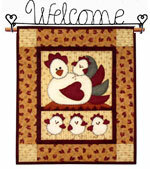 The new Amy Butler software from Electric Quilt is now available. The package contains 22 unique & stylish projects for the home: 8 quilts, 3 table runners, 7 pillows, 1 floor cushion and 3 bags. Plus 9 bonus projects. All the projects come with clear, step-by-step illustrated sewing instructions for all skill levels. Print patterns, fabric charts, and sew. You can sew the projects as they are designed – or customize in thousands of possible ways using the software’s tools and virtual swatches of Amy’s vibrant fabrics. The software is a stand-alone product but can be integrated with Electric Quilt 6.